The Giza pyramid complex (Arabic: أهرامات الجيزة‎‎, IPA: [ʔɑhɾɑˈmɑːt elˈɡiːzæ], "pyramids of Giza") is an archaeological site on the Giza Plateau, on the outskirts of Cairo, Egypt. The Pyramids of Giza consist of the Great Pyramid of Giza (also known as the Pyramid of Cheops or Khufu and constructed c. 2560–2540 BC), the somewhat smaller Pyramid of Khafre (or Chephren) a few hundred meters to the south-west, and the relatively modest-sized Pyramid of Menkaure (or Mykerinos) a few hundred meters farther south-west. The Great Sphinx lies on the east side of the complex. Current consensus among Egyptologists is that the head of the Great Sphinx is that of Khafre. Along with these major monuments are a number of smaller satellite edifices, known as "queens" pyramids, causeways and valley pyramids. Khufu’s pyramid complex consists of a valley temple, now buried beneath the village of Nazlet el-Samman; basalt paving and nummulitic limestone walls have been found but the site has not been excavated. The valley temple was connected to a causeway which was largely destroyed when the village was constructed. The causeway led to the Mortuary Temple of Khufu. From this temple the basalt pavement is the only thing that remains. 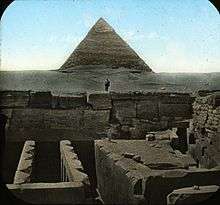 The mortuary temple was connected to the king’s pyramid. The king’s pyramid has three smaller queen’s pyramids associated with it and five boat pits. The boat pits contained a ship, and the 2 pits on the south side of the pyramid still contained intact ships. One of these ships has been restored and is on display. Khufu's pyramid still has a limited collection of casing stones at its base. These casing stones were made of fine white limestone quarried from the nearby range. Khafre’s pyramid complex consists of a valley temple, the Sphinx temple, a causeway, a mortuary temple and the king’s pyramid. The valley temple yielded several statues of Khafre. Several were found in a well in the floor of the temple by Mariette in 1860. Others were found during successive excavations by Sieglin (1909–10), Junker, Reisner, and Hassan. 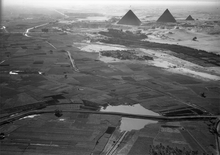 Khafre’s complex contained five boat-pits and a subsidiary pyramid with a serdab. Khafre's pyramid appears larger than the adjacent Khufu Pyramid by virtue of its more elevated location, and the steeper angle of inclination of its construction—it is, in fact, smaller in both height and volume. Khafre's pyramid retains a prominent display of casing stones at its apex. Menkaure’s pyramid complex consists of a valley temple, a causeway, a mortuary temple, and the king’s pyramid. The valley temple once contained several statues of Menkaure. During the 5th dynasty, a smaller ante-temple was added on to the valley temple. The mortuary temple also yielded several statues of Menkaure. The king’s pyramid has three subsidiary or queen’s pyramids. Of the four major monuments, only Menkaure's pyramid is seen today without any of its original polished limestone casing. The Sphinx dates from the reign of king Khafre. During the New Kingdom, Amenhotep II dedicated a new temple to Hauron-Haremakhet and this structure was added onto by later rulers. Khentkaus I was buried in Giza. Her tomb is known as LG 100 and G 8400 and is located in the Central Field, near the valley temple of Menkaure. The pyramid complex of Queen Khentkaus includes: her pyramid, a boat pit, a valley temple and a pyramid town. The West Field is located to the west of Khufu’s pyramid. 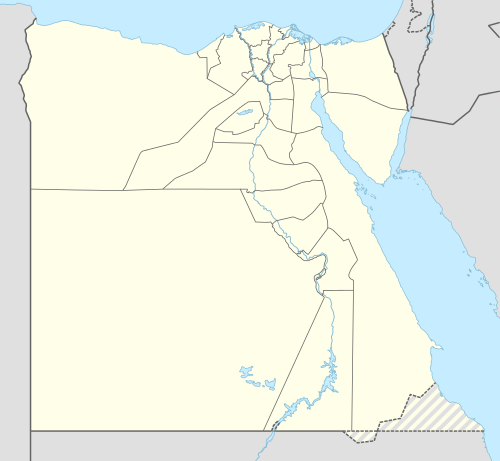 It is divided into smaller areas such as the cemeteries referred to as the Abu Bakr Excavations (1949–50, 1950–1,1952 and 1953), and several cemeteries named based on the mastaba numbers such as Cemetery G 1000, Cemetery G 1100, etc. The West Field contains Cemetery G1000 – Cemetery G1600, and Cemetery G 1900. Further cemeteries in this field are: Cemeteries G 2000, G 2200, G 2500, G 3000, G 4000, and G 6000. Three other cemeteries are named after their excavators: Junker Cemetery West, Junker Cemetery East and Steindorff Cemetery. Cemetery G 2100 the 4th and 5th dynasty and later Reisner (1931) G 2100 belongs to Merib, a King’s (grand-)Son and G2101 belongs to a 5th dynasty king’s daughter. This cemetery dates from the time of Menkaure (Junker) or earlier (Reisner), and contains several stone-built mastabas dating from as late as the 6th dynasty. Tombs from the time of Menkaure include the mastabas of the royal chamberlain Khaemnefert, the King’s son Khufudjedef was master of the royal largesse, and an official named Niankhre. 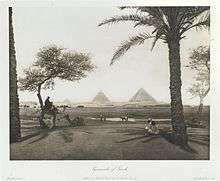 Tombs dating from the Saite and later period were found near the causeway of Khafre and the Great Sphinx. These tombs include the tomb of a commander of the army named Ahmose and his mother Queen Nakhtubasterau, who was the wife of Pharaoh Amasis II. The South Field includes some mastabas dating from the 2nd dynasty and 3rd dynasty. One of these early dynastic tombs is referred to as the Covington tomb. Other tombs date from the late Old Kingdom (5th and 6th dynasty). The south section of the field contains several tombs dating from the Saite period and later. In 1990, tombs belonging to the pyramid workers were discovered alongside the pyramids with an additional burial site found nearby in 2009. Although not mummified, they had been buried in mud-brick tombs with beer and bread to support them in the afterlife. The tombs' proximity to the pyramids and the manner of burial supports the theory that they were paid laborers who took great pride in their work and were not slaves, as was previously thought. The commonly held belief of slaves building the pyramids was likely to have been popularized by Hollywood films based on the original archaeological and anthropological opinion that they could not have been built without forced labor. Evidence from the tombs indicates that a workforce of 10,000 laborers working in three-month shifts took around 30 years to build a pyramid. Most of the workers appear to have come from poor families. Farms supplied the laborers with 21 cattle and 23 sheep daily. Specialists such as architects, masons, metalworkers and carpenters, were permanently employed by the king to fill positions that required the most skill. During the New Kingdom, Giza was still an active site. A brick-built chapel was constructed near the Sphinx during the early 18th dynasty, probably by King Thutmose I. Amenhotep II built a temple dedicated to Hauron-Haremakhet near the Sphinx. 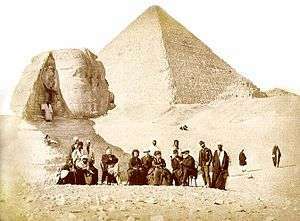 Pharaoh Thutmose IV visited the pyramids and the Sphinx as a prince and in a dream was told that clearing the sand from the Sphinx would be rewarded with kingship. This event is recorded in the Dream stela. During the early years of his reign, Thutmose IV together with his wife Queen Nefertari had stelae erected at Giza. Pharaoh Tutankhamun had a structure built, which is now referred to as the king's resthouse. During the 19th dynasty, Seti I added to the temple of Hauron-Haremakhet, and his son Ramesses II erected a stela in the chapel before the Sphinx and usurped the resthouse of Tutankhamun. ↑ Lehner, Dr. Mark, "The Complete Pyramids", Thames & Hudson, 1997. ISBN 0-500-05084-8. ↑ "Who Built the Pyramids?". Explore the pyramids. Retrieved 27 August 2010. ↑ "Who built the pyramids?". Harvard Alumni Magazine. July 2003. Retrieved 27 August 2010. 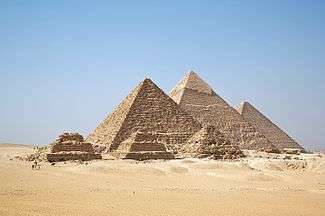 ↑ "Egypt: New find shows slaves didn't build pyramids". Associated Press. 11 January 2010. Archived from the original on 14 January 2010. ↑ "Nature". 16 November 2000. ↑ "Nature". 16 August 2001. ↑ "DIO The International Journal of Scientific History" (PDF). 13 (1). 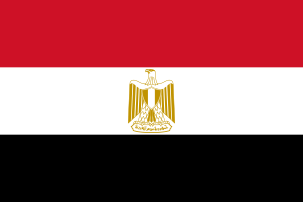 December 2003: 2–11. ISSN 1041-5440.